My animals don’t like fireworks and nor should they. They’ll be locked up safe and warm tomorrow night. 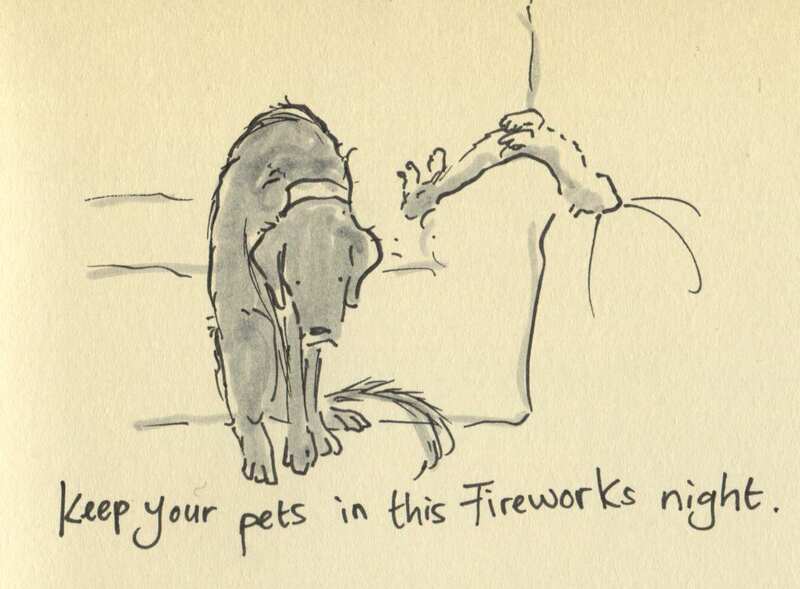 Posted on November 4, 2014, in Uncategorized and tagged Bonfire night, cats, Dogs, Doodlemum, Drawing, Family, Fireworks, Humour, Illustration, Life, Pen and Ink, Sketchbook. Bookmark the permalink. 5 Comments. Many years ago, around Bonfire Night, my husband had gone out to play in a ceilidh band, leaving me alone with his beloved Border Collie, Sally. I wasn’t feeling well, so was lying on the sofa, summoning up the strength to get up and go to the loo, when a MASSIVE firework went off. Sally, who had been gently snoozing on the floor by the sofa, leapt onto my tummy ( and full bladder), and lay there quivering for over an hour! We were all quite relieved ( literally, in my case) when she went deaf! It’s not nice for them. We’ll be in the garden but Bonnie will be in her crate, covered with a blanket and some nice treats, in the middle of the house and Arnie will be upstairs, chickens will be locked in. Shared on my FB page: this is an important message that needs repeating every year! Couldn’t agree more – keep them all tucked in with tv or radio up to mask the noise a bit. Our old cat was petrified every year and we found that keeping the house lights up bright helped as well – no sudden visuals to worry him along with the noise. :-).